*Claimer* There are no affiliate links anywhere in this post. I’m writing this as a service to my fellow bloggers out there. As an IT Manager by day, I get this question from a LOT of folks, both old and young, and it amazes me how little people know about finding a deal on a new laptop and getting the most bang for their buck! If you’re in the market for a new laptop you’ve probably already got a vague idea of what you’re looking for. There are different software and hardware platforms to choose from like Windows, Mac, and Linux. There are different price and performance ranges to look at. You could spend $500 on a “servicable” laptop or $1500 on an advanced gaming machine. But no matter what type of laptop you choose, or the performance and price level, there are several ways to find a good deal out there, and they don’t require knowing a lot about computers. One of my frustrations in life is when folks look for a new computer and want to spend the least amount possible, no matter the performance they get in return. Why is this frustrating for me? It’s frustrating because I’m an IT guy by day, blogger by night, and the folks that pepper me with computer questions are doing themselves and me a huge disservice when they buy a laptop that is going to give them problems right out of the box, run hot for the life of the machine (and run loud fans to compensate), begin to tear apart quickly due to inferior build quality, and only give them a couple of years of good service. All because they were unwilling to do a little bit of research instead of just buying the cheapest laptop they could find at their local big box store! Several computer manufacturers have entire websites devoted to their scratch & dent, open box, and refurbished computers. There is a WIDE selection available at Dell’s Outlet and Lenovo’s Outlet sites, and you can choose the model and performance features you’re looking for. These models typically run several hundred dollars less than new models, but they are probably a few months old. If you’re an Apple fan, the Apple Store has a section for refurbished Macbooks. Personally, I buy a LOT of refurbished computers, both laptops and desktops. They have been repaired by the manufacturer and come with the same warranty as a new computer. I’ve never noticed a difference in all my years of IT work. This means that the refurbished Dell XPS desktop machine I bought for my local church a few weeks ago was $580 instead of the $800 it would have been new, and I’m getting a premium machine with Windows 8, laser mouse, soft-touch keyboard, etc included. Now that’s a deal! Many of you have probably already heard of Slickdeals.net but if you haven’t, here’s the rundown: Slickdeals is basically a forum site where folks create posts with the details of a great deal they’ve found online. Deals may include electronics, clothing, or other items, but they are all from reputable and big-name brands. The many users of Slickdeals then vote the deal up or down, depending on how slick it really is. 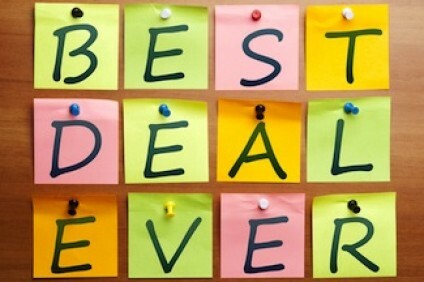 The best of the best (meaning they were voted up to 5 thumbs-up) make it to the front page of the site, where users can browse the best deals of the day. If you can watch Slickdeals for a few days, and have a good idea of what kind of laptop you’re looking for, this is an excellent way to find a deal. But you have to be ready to buy, because the deals really don’t last long (how cliche is that?) However, there are typically only 1 or 2 laptop deals that make the front page in a given day, so not a lot opportunity to grab a deal. But don’t lose heart! If you type “laptop” into the search bar at the top of the page, you’ll get a listing of any deal (good or bad) that’s currently in the site. Using this method you can often find 2-4 “thumbs-up” deals that are still good, but not yet “slick” according to voters. These deals are better than your run-of-the-mill sale and still provide substantial savings over the big box stores. If you can’t find what you’re looking for at Slickdeals, you can always revert to the online outlets and take care of your laptop needs. The great thing is that you can buy with confidence, knowing that the laptop you’ve found really is a deal, and you’re going to get quality service from the money you’re spending. Please let me know what you think of my recommendations, or feel free to ask me questions below. I really hope this helps some of you out, and please share it if you think someone else could use this info!